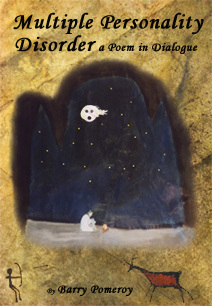 Multiple Personality Disorder is a dialogic poem told entirely in free verse. It consists of the interactions of six entities. Five of them are portions of the principal personality which have fragmented as a result of duress, a similar causation to that theorists suggest brings about multiple personality disorder. These six distinct characters are the original self, Bear, who is pulled from one crisis to another by the other personalities and is unsure of his own volition in this estranging world where he meets his fractured selves. The Caveman patiently waits on the hill at the entrance of a cave for a summoning to deal with violent situations. Sun, a dog, represents emotive and visceral living, and therefore has a role in bringing the self back to normalcy. Biss is the friend who has his own fears and stresses about daily life, and Bjorn exists only to cope with the savage loneliness of the self’s life, and as such, wanders throughout time and space, a character of forlorn and savage anger. Lastly, the Figure is an enigmatic force, as much ghost as the structural underpinnings of the mind itself. Early in the poem it can be seen only on the periphery of vision. Only later do we realize the Figure has its own scarcely imaginable agenda, and that the other characters are subject to its cryptic whims. The Figure is the most frightening of the group and its surreptitious manipulation of the others is what drives this narrative of self-exploration and admission of psychological distress.